The Ruby River – The Ruby is a terrific, small meadow river, we use several sections of the Lower Ruby . Alder Spring Creek – This is another very challenging spring creek and we have exclusive use. Boulder River – A small meadow stream tributary of the Jefferson River kept cool by many fresh water springs. You will find some fine mid summer dry fly fishing with attractor dries and hoppers. 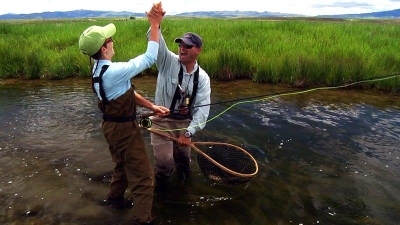 The Gund Ranch – Healing Waters Lodge is fortunate to build on the relationship established by Lilly & Kemph Outfitters with the manager of this ranch to put clients onto some of the largest rainbows, brook trout and brown trout in Montana. The ranch has three spring ponds ranging in size from a couple of acres to eleven acres. Wheat Ranch – A 4th generation rancher who controls several miles of the lower Beaverhead which is not floatable for guided anglers. We can however wade fish this very lovely piece of water. Additionally, there is a mile of side channel that fishes much like a spring creek. For those anglers who enjoy a few hours on a still water fishery this ranch has a small lake with very large rainbow trout. Morse Land Co. – We discovered some hidden gems on this property only five minutes driving time from Healing Waters Lodge. There are several miles of the Lower Ruby River, a short section of Leonard Slough (spring creek), miles of Mill Creek which is a terrific small meadow stream loaded with nice brown trout and a small pond for the still water folks . All private water fishing does require a rod fee for each angler. Prices very between $100 and $150 per rod per day.